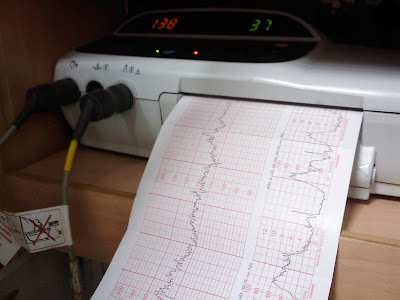 The spikes on the right are Renata's contractions We can see them getting stronger (amplitude), longer and more frequent. The urge to "push" is increasing along with the pain and our gynaecologist is on the way! Renata is 6-7cm dilated so looks like Talia will be here before dinner!